Jeanette Cosplay. This is my sad attempt at Jeanette cosplay. I know its not perfect, but its the best I could do with the things I could find in my room.. Wallpaper and background images in the Alvin and the Chipmunks club. 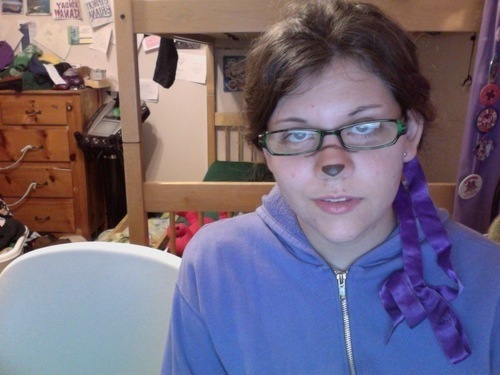 This is my sad attempt at Jeanette cosplay. I know its not perfect, but its the best I could do with the things I could find in my room. This Alvin and the Chipmunks photo might contain segno, manifesto, testo, lavagna, and poster. I'm such a super-dork, I know. Close enough! You win the Jeanette look a like contest. P.S. To be more accurate your button nose would have to be pink.